I played my first game yesterday, and I ached a little bit that night but overall felt great. It was just a simple 2 on 2 with some village kids but I huffed and puffed and did fairly well, I think each team won a game. Today I had to take a meeting with someone at The Fort. Going there was a 20 minute tricycle ride, a 40 minute shuttle ride and another 15 minute cab ride. I left at 1040am and was there around lunch. That’s pretty good and comparable to when I lived in Cainta, especially considering the approx. 60+ kilometer distance. The difference of course was virtually zero traffic and we were moving all the time. Under the same conditions the travel time to Cainta would be less than half, but since the idiots who run that place can’t get their heads together long enough to fix the traffic that’s never the case. 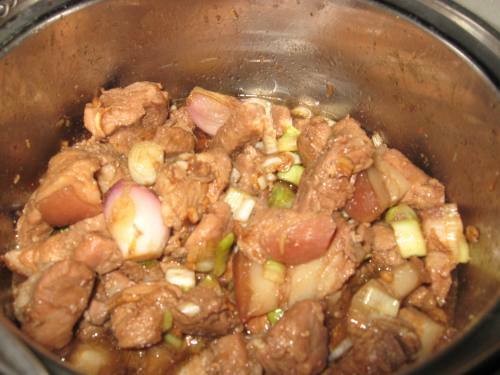 Anyway, here’s a pic of some adobo. This entry was posted in cooking, Random Thoughts and tagged adobo, commuting, gym, working out on January 5, 2010 by Gabriel Mercado.